The Amsterdam Gay Pride program lasts for 2 weeks, with the Canal Parade, street parties and main dance parties and events during the second weekend. Note that at the date of publications many of events and parties have to be confirmed. But since every year the main events are always about on the same dates we feel free to already publish those here. The pride week kicks off with a gathering at the Homomonument on Westermarkt. After some speeches the crowd will get on their feet for the yearly Pride Walk (that's not the official parade!) towards Dam Square and Vondelpark. Around the open air theater at the Vondelpark the Pride in the Park event takes place. It's a nice and relaxed festival starting with speeches, performances and the obligatory information market, followed by live acts and DJ's. The weekend before the main gay pride weekend features the open air gay minded Milkshake Festival. Milkshake will be held for 2 days in a row. It consists of 6 stages with (sort of) different music styles. Milkshake has an extreme open atmosphere, with visitors of all genders, sexual orientations and colors, often dressed up to the creative max. The week before the Amsterdam Gay Pride main weekend already many small events will happen all over town. 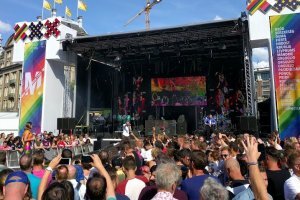 Open air cinema, a senior pride concert and the Pride at the Beach festival, at Zandvoort (Amsterdam Beach, about 30 minutes by train from Amsterdam). The real festivities kick off during the last weekend, with the Canal Parade on Saturday. Friday is the start of the main pride weekend. First real party night of the Pride weekend. This is the first night with outside street parties taking place. Street parties include Zeedijk, Spuistraat Prik party and Dam and Amstelveld (more str8). 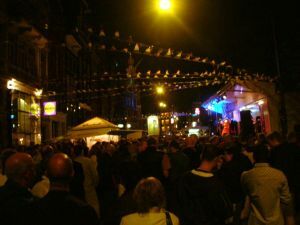 The famous Reguliersdwarsstraat won't have an outside stage but an intimate street party. Crash at the Beursplein (next to the Bijenkorf department store) will cater for the fetish community. 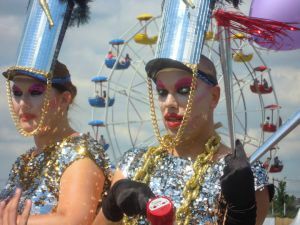 Make sure you do not miss the hilarious Drag Queen Olympics at the Westermarkt, where the Amsterdam drag queens will compete in a series of challenges. After the street parties you can continue dancing at one of the parties at Paradiso, Marktkantine or in the regular clubs. The weekly Friday underwear party at Club Church will be packed as will open minded Club NYX or gay club YOLO. The highlight of the Amsterdam Gay Pride weekend is the famous Canal Parade on Saturday afternoon. Where most parades use trucks, Amsterdam has boats! 80 themed and decorated boats with DJ's, singers, drag queens, gogo dancers and beautiful boys and girls will sail from 12:30 till 18:00. Next to the same gay street parties as Friday, which start directly after the Canal Parade, Saturday night is party night. This year there is a lot of choice in parties. See our agenda for a list of all of them, here are some of the highlights. Club Panama host popular bear party Bear Necessity. At the enormous Gashouder at Westergasfabriek you'll find the XXL edition of circuit party Funhouse. Younger guys all go to F*ng Pop Queers, a big trendy party at Paradiso. The regular clubs Club NYX, YOLO and Club Church will have parties as well and will get busy! Sunday is closing day. The traditional Pride Closing Party can be found at the central Dam Square in front of the Royal Palace. 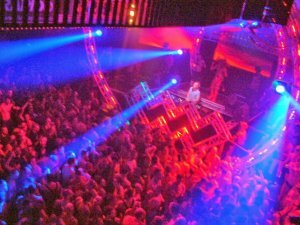 It takes place in the afternoon and evening with many Dutch and international artists and DJ's. It's a mixed gay crowd, trying to survive the hangover and celebrating the last day of the Amsterdam gay pride. As an alternative to the main closing party Rosario will have it's own massive pride closing party at the Blauwe Theehuis in Vondelpark. Having survived Funhouse XXL, the circuit boys party on at packed party Rapido at Paradiso which starts in the afternoon. And those on enough Red Bull and other stimuli find their way to the X-Ams After at Westerunie, to jump on until 9 am Monday morning. From then on, it's another year waiting for Amsterdam Pride.